Flying on Malaysia Airlines is very much a 1980s experience. You get the feeling of a full-service airline, which has resolutely refused to modernise. This could possibly be the reason why some of the planes, particulaly on domestic routes, are frequently very empty. 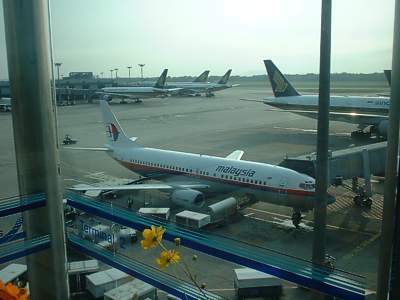 At checkin in Malaysia it is worthwhile asking for a specific seat - and then checking your boarding card to ensure you have been given it, and that your Enrich number has been correctly recorded. Otherwise you may find that the Malaysia Airlines system of filling up the planes from the back results in you sitting all squashed in - while there is plenty of space at the front. At Malaysian outstations, like the UK and Australia, the staff apply a somewhat more logical system. You can also phone up at any time before your flight and request the seats you want. As you board, there will be music playing. 1960s lift music. The safety announcement is often carried out manually, the old fashioned way. Spot the introduction saying "This is your seatbelt..." - which most airlines stopped reading out years ago, mainly due to the laugher from the back of the plane. It kind of sets the style of the flight, when the staff resolutely follow the rules - often reading them out as they carry them out. There are silly things, such as waking passengers to open window shades when hitting turbulence. I understand the issue of raised shades for landing and taking off, but for mid-air? It does help that fingers are used to gesticulate the raising of the shade, and the request is an order. In Economy you will get offered a hot towel, even for the shortest flights. Newspapers are no longer brought around. Even on short domestic flights you will be offered a choice of hot meal (with full metal cutlery, except for flights to the UK and US), and free alcohol. The 737s are never short of staff, however the 747s do suffer from rushed cabin crew. On Long-haul flights you have to specifically request washbags. These contain a toothbrush and razor.